With the passing of Erik the Red, our beloved RCO, an era of superlative service from four ship’s cats has come to an end. We would like to thank everyone for their kind thoughts and for sharing their warmest memories of Erik. Steve Read, our shipkeeper has composed a heart-felt tribute to Erik that summarizes his career and the many adventures that kept him busy on the waterfront. With thanks to Steve, Gerry Lunn and Fred Cox for their photographic skills. ‎Erik joined the Museum Crew during autumn of 1998. 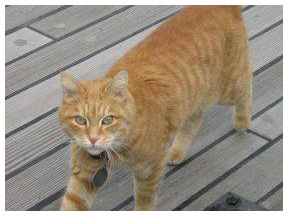 One evening, Steve Read, one of the ship's staff, noticed he was being followed the length of Gottingen Street by an orange tabby, who wouldn't take no for an answer.‎ He came aboard ship and has been a part of the crew ever since, taking on the role of Junior Rodent Control Officer. A trip to the vet revealed that Erik was about three years old and that a return visit would have to be arranged for another three months. Despite coming back from that second visit with two less pieces of tackle, Erik's love for the ship and her staff is as strong as ever. Erik is more of roamer than Clara and likes to frequent the many businesses that occupy the Summit Building on the Halifax waterfront, where he is held in high esteem. The Museum is constantly receiving pictures of Erik from various companies in a variety of hats and poses, which speaks volumes as to how much he is loved. His roaming has occasionally landed him in hot water and he has been taken home by people from time to time under the false assumption that he is lost! As his tag says, "I know where I live, please put me down!" As staff were arriving at the Museum at 8:30 one frosty morning in December, 2007, it was noted by a member of the public that a cat had been seen in the Harbour during what was an extremely nasty part of the day. It was Erik!! He had been overcome by curiosity and was investigating some work being done on the waterfront when he went in. Seizing a small pontoon boat, our heroic boatbuilder Eamonn Doorly hit the harbour to fish out the frozen feline, assisted by our intrepid security officer Jason Muise, who tended the lines to the boat from the wharf. Once ashore, Erik took off like a rocket, leading to the formation of a search party. Erik was found at one of his favourite haunts, in the Summit Place, where the staff, who know and loved him well were tending to his sad, soggy self. Erik was just fine once he dried off but certainly went through at least one of his nine lives! The Maritime Museum of the Atlantic is currently the home to Merlin, our Rainbow Macaw, who is as much a part of the staff as any of the two-legged members of the Museum Crew. All of our museum mascots have their own story to tell. 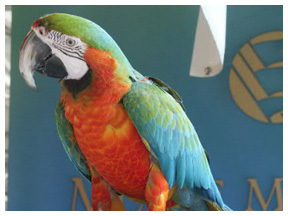 Merlin, our Rainbow Macaw, joined the Maritime Museum crew during the Pets at Sea, March Break event in 2006. Merlin is particularly fond of green grapes, peanuts, carrots, walnuts and yes, even crackers! Merlin has two meals each day. Rainbows macaws are a hybrid, caused by cross-breeding the Scarlet and Golden Blue macaw. Most people assume that Merlin comes from the Brazilian Rain Forest but the closest he'll ever get is if our sprinkler system goes off by accident! Merlin has a visit to the vet every six months for a general inspection and to have his pin feathers clipped. This prevents him from taking off into the rafters of the Museum and allows for people to enjoy him at closer range. Since macaws can live to be 80 or 90 years old, you'll have plenty of chances to stop in for a visit. Merlin is quite talkative and laughs and sneezes on a regular basis. "Cracker" and "Peek-a-boo" are a regular part of his vocabulary. He is usually willing to talk to people but is also quite happy to chat to himself, especially during the middle of the afternoon, when he sometimes has a nap. Merlin is now live on the Web! He has his own webcam on Nova Scotia Webcams and you can watch him in real time, complete with sound! You can also leave messages for Merlin but don't expect a reply anytime soon! 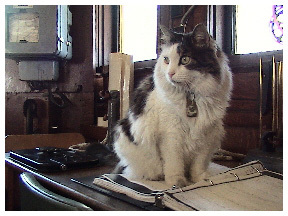 Since her arrival at the Museum wharves in 1981, the retired hydrographic survey vessel CSS Acadia has been the home to four ship's cats, which we classify as Rodent Control Officers. The first was Nannie, a coal black tabby, who gave birth to a litter of kittens aboard ship and who vanished one year when Halifax was host to the Atlantic Bowl College Football Championships. She was succeeded by the magnificent Bertram Q. Bilgewater or Bert, a dead-ringer for Sylvester from the Bugs Bunny cartoons and one of the waterfront's most popular residents for many years. Bert embodied the true spirit of the wharf cat, tangling with a variety of critters over the years, from rats and gulls to mink and much larger dogs! After many years of gallant service, Bert was struck down by a sudden illness and despite a heroic fight, detailed in the local newspapers, passed away. Clara was rescued from the Bide-a-While animal shelter as a replacement for Bert. Although described by shelter staff as "feisty", she decided that she would rather assume the role of the ship's official mascot. She was very friendly and docile and people of all ages were drawn to her gentle, plus-sized charms. Clara may well have been the most photographed cat in town and she loved to roam the waterfront in search of new people to meet and from whom she could bum food. Clara decided to retire ashore in early 2010. She had an incredibly comfortable retirement but her health began to decline by the end of November. It had been hoped that we might bring Clara back to the ship one last time in early December to have a fond farewell but sadly, Clara passed away on the morning of December 7th, 2010, with her best friend, shipkeeper Steve Read by her side. Clara was a wonderful friend, a great companion and the true definition of a wharf cat. She met thousands of friends during her lifetime and she will be missed. God speed old girl.